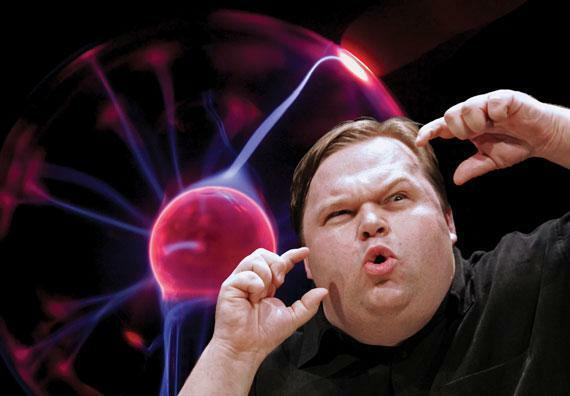 I’ve believe I am now going to look upon Mike Daisey as a source of inspiration. When I have decisions to make regarding moving myself forward as an artist and my company forward as a business, I will heretofore take at least a minute to consider how Mike might handle the situation. I am not herein committing myself to acting in accord with what I think that direction might be, but I will undertake to take it under advisement before making a move. There’s just something about the man that’s…well, brassy. And I think indie theatre needs some more brass. I’d seen the clip, and I’d read the essay, and I’d witnessed the battle. And now, at last, I’ve seen the work. Mike was sourced for the recent PuSh International Performing Arts Festival here in Vancouver by Norman Armour, the Exec Director of the Fest himself, who offered Mike and his monologue to us the night of his show as “a treat”. And the show we were treated to that night lived up to my anticipation with some room to spare. As an activist presence here on the theatrosphere he’s smart, scrappy and high-minded, and he’s armed with a considered set of ideals that he wants to get up in the face of anyone who will lend him an ear. On stage, in the work, he’s undoubtedly mesmorizing, and I totally get why his exclusive style of theatre is the monologue. He’s just…big. He’s got a big voice that straightens your spine in your chair when he dials it up, he speaks of big ideas that wander in and around each other as he sits there; centre stage in a big chair behind a big desk on a small stage talking to a small crowd, for one and a half hours pausing only to, both literally and as a punctuation mark, turn the page. Rare is the true storyteller that can hold an audience with language alone and have it hailed as successful theatre. It takes balls. Big ones. He is, to quote Tom Loughlin on A Poor Player, a force for change in how theatre is created, and since being inducted as a Mike Daisey audience member I have been fixating on the power of simplicity and directness coupled with confidence. An American confidence, for want of an identifier, that landed right on top of this polite Canadian crowd at the PuSh Club, sprinkled as it was with some of our brightest theatre specimens. MONOPOLY! was the title of show that Mike brought up to Rain City, a solid choice for a Canuck crowd, dealing in tales of Microsoft, Wal Mart, the battle between the progenitors of Direct and Alternating Current and the true story behind the success of the titular board game. It’s a deft storyteller who considers his audience, and of the 14 monologues at his disposal this was a well-chosen piece for us. We could identify and relate to all of the monologue’s components despite the fact that its author was on foreign soil. And that’s a great lesson right there: the consideration of your audience when it comes to choice of material. Would we as easily have been able to identify with one of Mike’s many essays on the state of affairs of our downstairs neighbours? Perhaps, but certainly more passively. And passivity is a state not sought after in the enclave of the theatrical form. I’m not saying that I agree with everything that Mike Daisey trumpets. I do however think that he embodies a certain set of ideals that we in independent theatre need to gravitate towards a little more if we’re going to erupt as an industry. A Daisey performance contains no unnecessary flourishes or set pieces, no extraneous fluff. He creates a space to inhabit while he works that contains a set of rules that are determined by his art. And everything on the set and in his material has a purpose, and behind that purpose there is obvious consideration. It’s clear to me that Daisey has a goal for his work, and for the industry in which he plies it. And to reach that goal he is prepared to tackle the obstacles head on, and quite prepared to be loud about it. Thanks for coming up for a visit Mike, consider some of your energy transferred.